Our team at Aegis Dental is proud to serve as your emergency dentist in Carrollton. When you run into unexpected tooth trouble, give us a call and we’ll make room in our schedule to see you as soon as possible. If your situation is particularly urgent, you can even contact Dr. Chandy after hours. Her expansive skillset and compassionate touch will help relieve your pain and protect your smile’s long-term well-being. Dental emergencies fall into one of two categories: long-standing oral health problems that suddenly announce their presence, and traumatic injuries. Dr. Chandy is well-qualified to help with both types of problems. 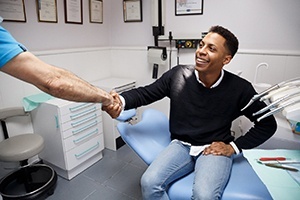 Before you get to our office, however, there may be a few steps you can take to mitigate your discomfort and prevent further damage to your tooth. 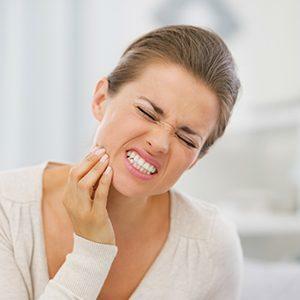 When you have a toothache, you should avoid chewing on the side of your mouth that hurts and don’t consume any very hot or cold foods or beverages. It’s okay to use mild painkillers to take the edge off your discomfort. When you arrive in our office, Dr. Chandy may recommend root canal therapy as the best way to save your tooth. If an accident caused you to chip or break a tooth, you should avoid putting pressure on that tooth until you visit us for your appointment. Sometimes, a broken tooth is mostly a cosmetic issue that we can repair with bonding or a veneer. In other cases, root canal therapy and/or a crown may be necessary. If the damage is severe, extraction is also a possibility. Time is of the essence when one of your teeth gets completely knocked out of your mouth. If you receive professional treatment within an hour or so, it is possible that we’ll be able to reattach the tooth. Call our office right away so we can prepare to receive you. You should also take steps to preserve the tooth. First, gently rinse the tooth, holding it only by the crown (the top part). Then, either place the tooth back in its original socket or in a glass of milk. If no milk is available, water will do in a pinch. In some cases, it might be possible for you to temporarily replace your lost restoration. However, that doesn’t mean you can delay professional treatment. Dr. Chandy can permanently reattach the crown, create a new one, or place a new filling to make your tooth strong again. In the meantime, you should be gentle with the tooth and avoid extreme-temperature foods. Stick to an excellent oral hygiene routine that includes twice-daily brushing and once-daily flossing. Visit our office for a checkup and cleaning every six months. Seek professional help at the first sign of an oral health problem; don’t wait until your pain is unbearable. Always wear a mouthguard when you’re playing sports. Custom mouthguards tend to offer better protection than stock ones. 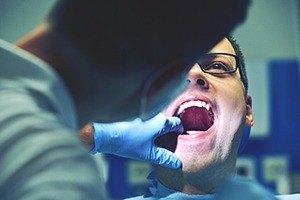 Of course, the cost of your procedure will depend on the nature of your oral health problem. We’ll be sure to discuss your treatment options with you and explain the costs associated with each. Our office is glad to offer financing for major procedures, and we’re in-network with several major PPO insurance plans.